It’s difficult to describe the descent into Iceland without passing it off as melodramatic. Despite it being only 4pm, we descend from multiple thousand feet with only a solitary white spec – the runway lights at Keflavík International Airport – shining through the inky black darkness. There is no bustling metropolis beneath us, and the nearest city centre – Reykjavik – is some 50km away. It’s a timely reminder that we really are in the middle of nowhere, as is a dot on the bottom left-hand side of the flight map tracker that simply reads ‘Titanic, 1912’. 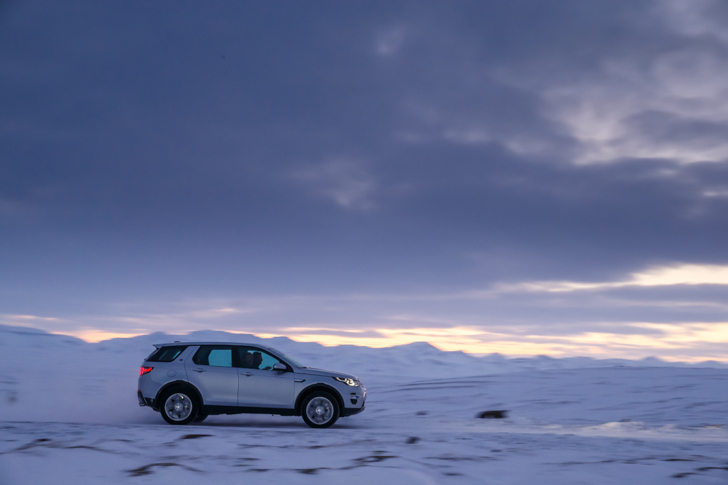 And it’s here, on an ocean-locked island in the Northern Atlantic that boasts sub-zero temperatures, active volcano fields and barely five hours of sunlight a day that Land Rover has chosen to launch its new Discovery Sport. For the marque, it’s a perfect fit for its ‘go anywhere’ alternative image. For me, it’s a risk. Replacing the outgoing Freelander – a Land Rover staple since 1997 – the brand new Sport marks the first time that the Discovery (LR4) has ever been launched as a range rather than a standalone model. Significant enough in its own right (sales of the Discovery have consistently risen since its release in 1989), there is a little more to it than that. The Sport for instance marks the debut of Land Rover’s new fuel-savvy nine-speed automatic gearbox. An all-new multi-link rear axle should – in theory – improve both on-road and off-road prowess by compromising neither comfort nor terrain response. To provide more space for passengers and improve vehicle rigidity, the Discovery boasts a brand new, lighter weight monocoque body structure built from high-strength steel. The new 5+2 seating represents Land Rover’s commitment to more efficient ‘packaging’: so fanatical was the company in this endeavour that even initial claims that the design was impossible were overlooked, leading to MANY re-designs. The new Discovery Sport then represents much more than just a new generation of the model: it’s a significant design statement on all Land Rovers to come. And for the company to put its money where its mouth is against changeable weather, impassable terrain and a significant drop in Vitamin D supplements leaves little room for error. On this launch, Land Rover can’t afford mistakes. 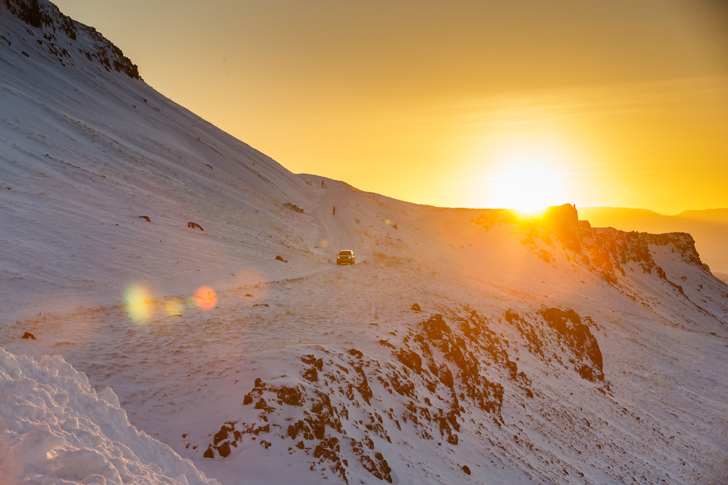 The smiling JLR team that welcomes us is all too aware of this, and shortly after landing we’re supplied with a heavy-duty overcoat, gloves, a woolly hat and a head torch each. It all seems a bit over the top until we step out of the terminal into the darkness and wind. It is bone-chillingly cold, each blast of the wind akin to sharpened chopsticks poking me in the cheek. Through the darkness our Discovery Sport convoy is only barely lit, clouds of powdery snow whirling about our faces making it difficult to see 10ft ahead. How on earth are we supposed to drive a car in these conditions? Looks-wise, the Discovery Sport doesn’t immediately fill me with confidence either. Don’t get me wrong, the Evoque and Range Rover lineage in those rounded bodylines, subtly slick headlights and gracefully sloping roofline make the new Sport fantastically handsome, and I’m particularly keen on the taillights which – unlike the Range Rover and Evoque before it – find the correct balance between elegance and presence. But out here in the wilderness, I’d expect something a little more rugged. Indeed, the Viking-style off roaders, complete with 40-inch tyres and multi-storey ground clearance we come across later on in our journey, fit the location nicely. But does the ‘softened’ Discovery really have what it takes? It’s a question that consumes me as we alight our convoy (ah good, the heaters are on) and begin our drive out of town, low-rise apartment blocks getting gradually smaller in our rear-view mirrors and the darkness through the windscreen somehow more emphatic as a result. It’s the wind speed though that beggars belief. We’ve been warned pre-drive that the weather could change in a flash, but the speeds the wind starts to hit – and the amount of snow it picks up as a result – is unlike anything I’d expected. With limited visibility, reflective posts lining the sides of the road are the only visual markers we have to keep us from careening into a hidden trench. Unsurprisingly, it’s not too long before we’re brought to a halt, a road on our route now completely impassable due to the snow. Turning around is impossible – even the markers have started to disappear – and it’s nearly half an hour before a Defender complete with fetching snow plough across its grille arrives to forge a path. 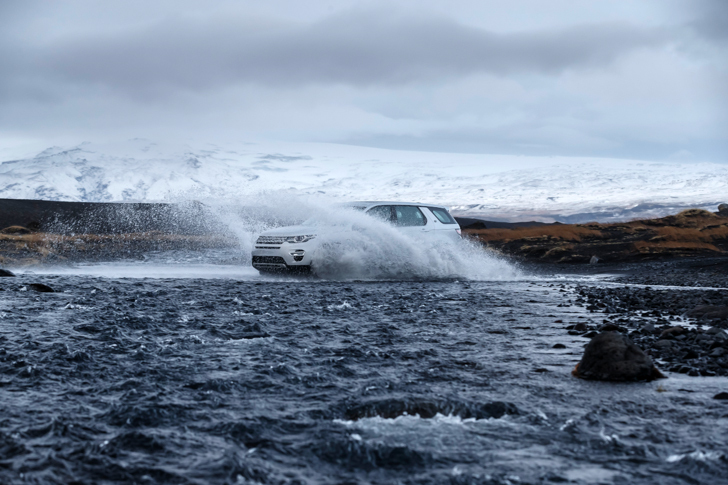 The wind shows no signs of abating, buffeting the side of our Discovery Sport like it’s trying to pick a fight. Though the scene through the windscreen is genuinely tense, the confines of the Discovery Sport take the edge off. Build quality and materials are superb, the cabin an impressive mixture of cosy and elegant. There’s more than a little carry over from the Evoque too, so Land Rover fans will find the rotary dial gear lever, the leather upholstery and eight-inch touchscreen infotainment system familiar. It’s perhaps not quite as luxurious as the Range Rover but it’s very upscale. 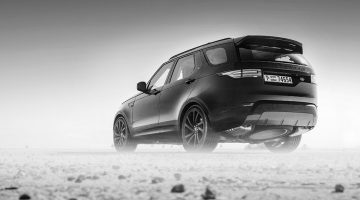 Even on studded tyres – the only mod the Discovery has received for our drive – road noise and ride comfort are limited and excellent respectively. I’ve no doubt I’m more comfortable than the Viking Truck drivers, but again, it makes me wonder how this civility will handle the conditions. At our rest point at Hotel ION – which I’d half expected to be made of ice – I begin to wonder if Land Rover has bitten off more than it can chew. As the Dinah Washington song goes, what a difference a day makes. Dawn hasn’t fully arrived but the wind has dropped significantly, and where yesterday there had been only ice pelted at me from all directions now lies a valley of crisp, untouched snow. By 11am the sun has risen to its height, bathing everything in a majestic blue sheen. Back on the road, quaint villages appear on the horizon and we even tweak the interest of some Icelandic horses as we drive by on the gravelled road surface. It remains one of the most beautiful scenes I’ve ever come across. I can understand why off-road driving is so heavily regulated. The renewed scenery is just one of my focal points: it’s not the smoothest of road surfaces, but once again the Discovery Sport is proving remarkably civilised and comfortable. Pull from the top of the range 2-litre turbocharged four-cylinder under the bonnet for instance is insistent rather than sharp, and while many have questioned whether 237bhp is enough for a 5(+2)seater model weighing 1841kg, I seriously doubt any more is needed. At pace, we are simply eating the kilometres, a solid driving position and plenty of head and legroom keeping fatigue nicely at bay. 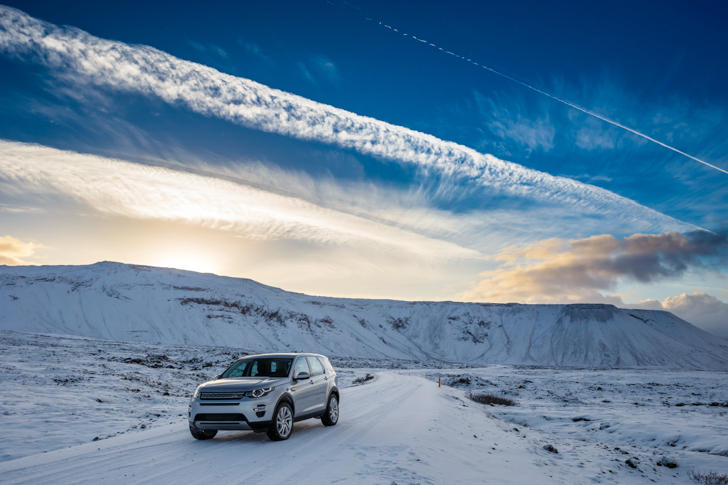 There’s no trace of lag or gutlessness from the four-cylinder, smooth crisp changes through the nine-speed auto ensuring we skim across Iceland serenely, that newly configured suspension already proving its worth. Corners are few and far between, but those we do come across suggest there’s ample stiffness from that lightweight aluminium chassis, a low centre of gravity meaning there’s little lean to concern us either. Said premium cruise comes to an abrupt halt down the road when we hit our first obstacle: a river. My nerves are given a shake when our support crew in the accompanying Defender heads across first, the slope into the water – from my perspective at least – almost vertical, the underside of the body and suspension couplings in full view as the bonnet creeps further and further into the icy abyss. Soon it’s up to the headlights, and though we’ve been assured that the Discovery can wade at up to 600mm (around 2ft), the water looks much deeper: indeed, it’s only later that I’m told the actual depth is nearer 750mm, a result of heavy snowfall over the past few days. Eventually the Defender starts to rise out of the water on the opposite bank amid applause from the crew braving the crisp afternoon temperatures. Then it’s my turn. The Active Driveline four-wheel drive system is set to low range for optimum pull and limited slip from those enormous tyres. Here is another area where Land Rover has worked tirelessly, the system automatically switching from 2WD to 4WD to ensure traction is sent to the correct wheels where required. Gripping the wheel slightly tighter than I thought, the Discovery starts its seemingly vertical creep into the river, the water level rising up the bonnet almost torturously slowly. Saying it looks cold would be an understatement. Soon the front wheels begin to level out, the rears following suit. I’m in the river, water up to the headlights and threatening to flood over the bonnet. And the Discovery Sport hasn’t even broken sweat. It’s incredible, 250lb ft of torque creeping Land Rover’s latest forward with composure and finesse. There’s no crashing sensation against the rocks under tyre, no loss of momentum from the Active Driveline, and no sense of panic. Halfway across and the Sport is still pulling, effortlessly. Even at the wheel, the civilised ride I’d experienced on the road just 30 minutes earlier hasn’t abated. I’m not fighting the front tyres for control, nor aware of body roll or lean about to tip us over. What had been a smooth, comfortable, gentlemanly ride on the road has transformed into an effortless river crossing. From the ‘softened’ Discovery, not a harder-edged Defender LR4. It’s truly staggering to behold, the grin on my face causing much amusement for the service crew when I finally creep onto the opposite bank. A quick spin through the snowy dunes shows this to be no fluke either, composure once against unwavering as the Discovery hits gradients I’d expected its relatively limited ground clearance to fall victim to. But no. Feedback from the wheel – power assisted for comfortable on-road cruising but direct nevertheless – gives me the confidence to push harder than I’d expected on some of the steeper slopes, the 4WD system once again ensuring pull through the tyres is ceaseless. There is a manual override on the nine-speed box, but transition between gears in automatic is so smooth and crisp that I soon abandon it altogether, allowing the Discovery – as it has been doing throughout – to do most of the work for me. Again, on these climbs and across the undulating plains, the apparent lack of horsepower isn’t an issue. The transition from ‘road’ to off-road is staggering, especially since there’s been no real negative difference in comfort, composure or finesse. It’s only the onset of night – at 3pm – that calls time on our game, an almost menacing yet beautiful collection of volcanic reds and oranges on the horizon as the sunsets. It’s this final image that sticks with me as we make our way back to our overnight halt. Much like Iceland the Discovery Sport has been an enigma, showing glimpses of beauty and elegance yet harbouring a hidden ‘edge’. Like the quick changing weather and merciless forces of nature, the Sport’s off-road capabilities have left me astounded. The softened design looks ill-fitting against the harsh terrain around us, as does the civilised and beautifully constructed interior. And yet beneath this composure lies an ability few – myself included – thought possible. An agility that seems effortless, the transition from real world to wilderness seamless to the point that one wonders how Land Rover managed to get two such different characteristics into the same vehicle. The Discovery Sport is a triumph, and surely marks only the start of further good things to come. Driven. The all-new 2018 Range Rover Velar.